Located in Branson on beautiful Table Rock Lake, Stormy Point Village is an enchanting resort styled after a timeless Cape Cod style fishing village. Surrounded by the serene beauty of the Ozarks, the resort is located just minutes from the endless attractions and great shopping. Stormy Point Resort is also within close proximity to the beach, restaurants, shopping and attractions, making this a fine choice for any family. 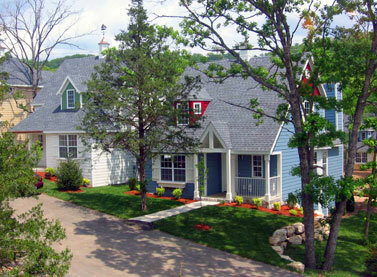 This wonderfully scenic vacation resort is located on the shoreline of beautiful Table Rock Lake. From the spectacular location of Stormy Point Village to the exquisite New England style architecture, everything is here to ensure that your vacation leaves a lasting impression. The two and three bedroom cottages are classic and contemporary, and luxurious in design. Each cottage features fully equipped kitchens with granite countertops and stainless steel appliances, plasma televisions, whirlpool baths and a private porch for relaxing in the fresh mountain air. The resort hosts a 20,000 square foot clubhouse with game room, fitness center with sauna, three pools and a poolside cabana grill. Stormy Point Village, a quaint Cape Cod style neighborhood, nestled on the shore of beautiful Table Rock Lake is a perfect vacation ownership Resort. Its exquisite New England style architecture makes Stormy Point Village a most coveted vacation destination with a truly unique setting. Spacious accommodations and stylishly designed, offering a haven of relaxation Stormy Point is an Interval International Five Star Resort Top requested resort destination Floating weeks, vacation when you want to go Deeded real estate, you own your vacations for life Spectacular resort amenities and daily activities 2006 CNN Money article listed the Branson Market as one of the hottest spots to buy property in the nation. Branson, Missouri located on beautiful Table Rock Lake has become known as the "Live Entertainment Capital of the World". Located 35 miles south of Springfield, Missouri on U.S. Highway 65, it is within minutes of either Table Rock Lake or Bull Shoals Lake. Branson is unique in its tremendous variety of entertainment offerings. With over 50 theatres and 100 different shows, Branson has more live shows than anywhere else in the country. For family adventures, Branson is home to some of America's top theme parks and museums.